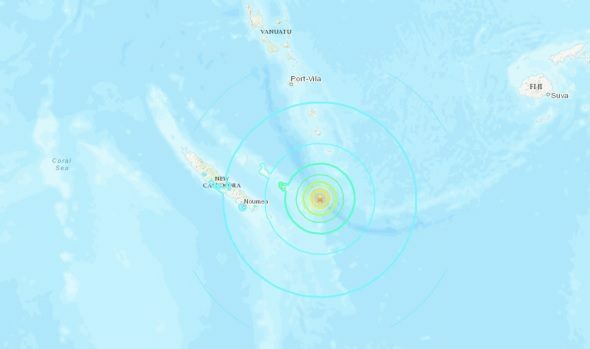 Tsunami warnings were issued after a powerful earthquake struck off the coast of New Caledonia on Wednesday afternoon, local time. The 7.5 magnitude earthquake struck 104 miles (168 km) east-southeast of Tadine, New Caledonia, at a shallow depth of 6 miles (10 km), according to the United States Geological Service (USGS). Shortly after the earthquake occurred, the Pacific Tsunami Warning Center (PTWC) warned that tsunami waves of 3-10 feet (1-3 meters) were possible along the coasts of New Caledonia and Vanuatu. The warning also stated that tsunami waves of 1-3 feet (0.3-1 meters) were possible along some coasts of Fiji, according to PTWC. A few hours later, the warning was canceled. “The tsunami threat has now largely passed,” the statement read. Small waves reportedly hit Aneityum, which is the southernmost island of Vanuatu, but the waves only reached 7 feet beyond normal tides, The Associated Press reported, citing the media director at the Vanuatu Daily Post. No damage has been reported in New Caledonia’s capital of Noumea. Several aftershocks have rocked the area following the strong earthquake, with one of 6.6 magnitude.